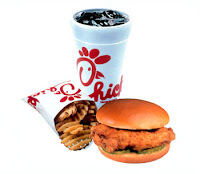 Ah, Chick-Fil-A... How do I love thee? Let me count the ways. In addition to being the only fast-food restaurant in which my children have dined (not counting the terrible Wendy's in South Hill, when there was no Chick-Fil-A for miles and miles), it is my hands down preference every time. And check out reason #5, which I just discovered this week thanks to my mama-friends who apparently had known this little gem for ages. I love how the employees say "my pleasure" in response to everything. Another refill? "My pleasure." Some polynesian sauce? "My pleasure." Carry your food to your table and entertain your children while you eat? "My pleasure." I love the food. The kids meal (which come with a juice box and a very tasty fruit cup), the chicken minis at breakfast, the waffle fries. And who else has Diet Coke, Diet Caffeine-Free Coke AND Coke Zero on tap? I love that the restaurants -- including the bathrooms -- are always clean. Never scary to change a diaper on the one-year-old and take the three-year-old to the potty, even at the same time. I love the cows. Even though my son is terrified of the actual walking cow mascot and leaps across the table into my lap to avoid him whenever he wanders nearby. I especially love the bilboards where the 3-D cows are painting misspelled messages. I love that you can get free ice cream by trading in the toy from your kids meal. It's genius -- Juni gets ice cream (which means that I get ice cream) and I get to leave the toy behind (which means that it's not cluttering up my already messy house). What will they think of next?! Juni: Mommy, Baby is hungry. Me: Okay, do you want to share your snack mix with her? Juni: No, mommy. Baby wants to nurse. I will feed Baby on my nibbles. At this point, I should explain that "Baby" is a tiny white bear that came attached to a vase of flowers someone sent to me when Juni was born. She should have been a throw-away toy, but has instead become his most trusted sidekick. After he announced that Baby would nurse on his "nibbles," Junius held her close against his chest (and, by default, the car seat harness), covered her with his blanket and waited. I watched him in the rearview mirror as he peeked under the blanket to check on Baby. About 30 seconds later, he switched her to the other side of his chest and repeated the process. Then he pulled her out from under the blanket and shouted, "All finished! Baby is very little, so she doesn't need much. That's all I have in my nibbles." And yes, should he ever get married and have children, I will repeat this story in front of his wife. Why is it that both of my kids can fall asleep in the middle of the day on the way back from the Farmer's Market (a 15-minute drive), but neither one of them even starts to doze off on the hour-plus drive home from the grandparents' at bedtime? Must be some sort of toddler conspiracy. They know I want to use the quiet time in the car to talk to friends, so they just keep talking to me. And talking. And talking. And talking. And talking. Mixed in with some crying. And a little whining. And more talking. Much work to do this morning, so I'm need of some pep in my playlist. We've been listening to Here Come the 1 2 3s by They Might Be Giants all weekend -- it's awesome, but I need some "grown-up" music now that the kids are at preschool. This week's selections represent bands I've seen perform that all have North Carolina ties (I think). Mostly, I saw them back when I was young and single and living in Charlotte after college. Seems like a lifetime ago, but the music is still great. Does it mean I'm getting old if, every time I go to the doctor, I leave something behind? Not my keys or my phone -- those I seem to remember. Instead, I keep having to abandon some small part of myself. At first, it was just my dermatologist. She'd take one or two little slivers of skin each time I went to see her (which was every six months for the first two years). I'm rather fair-skinned and freckle-y -- that combined with some bad sunburns in my wild and crazy tanning youth makes me a prime candidate for regular skin checks. For several years, she'd take the sliver and call me a couple weeks later to say it was "all clear." Then last summer I went in for my annual check and mentioned the spot in the middle of my forehead, which I assumed was a persistent pimple left from my pregnancy. I figured she'd give me a cream and send me on my way. Instead, she peered at my forehead and said, "Hmm. We'll need to biopsy that, but it looks like a carcinoma." I'm sorry, did you just say "biopsy"? And isn't "carcinoma" a fancy word for "cancer"? Long story short, it was in fact a basal cell carcinoma, which I later had removed by a Mohs skin surgeon who seemed startled to see someone young like me in her office. Once she cut out the layers of cancerous cells from beneath the pimple, I was "all clear" again. The small scar that stares back at me each morning is my reminder to put on sunscreen. Now it turns out my dentist wants in on the action. When the hygienist noticed a red spot on my lower gum at my check-up last month, my dentist told me to watch it for a few weeks and call him if it wasn't gone. Probably nothing, he said, but keep an eye on it. A month later I was back in his office getting a referral to a periodontist. Second long story short, the periodontist removed the spot -- probably nothing, he said, but let's biopsy it to be sure. He called on Friday to tell me it was inflammatory epithelial and fibrous hyperplasia. Also known as a pregnancy tumor. Which sounds scary, but actually means it's nothing but some "overgrowth" in my gums caused by the raging hormones of pregnancy and breastfeeding. Thank goodness there aren't any doctor appointments on my calendar until September. Harbingers of spring take different forms for different people. For some, it's the start of baseball practice or the panic of tax day. For my dad, it's probably the spring football game in Blacksburg this weekend (go Hokies!). For me, it's the fact that the forecast for next four days is sunny and 90 (sorry for those of you not reading this from the South). Although the temps might feel more like summer, I'm so relieved that it finally means we've turned the corner away from winter. Pollen: Okay, not so much the sneeze-inducing, car-covering yellow mess. But I do love what it does to my yard, especially this year. Front and back, our garden is filled with blooming azaleas (see photo), irises, tulips, camellias, dogwoods and more on the way. It's absolutely gorgeous. Outdoor concerts: The only thing better than a good live music show is a good live music show outside with a picnic. We just reserved our tickets for two shows at the N.C. Museum of Art amphitheater -- Pink Martini and a kids show with They Might Be Giants. Gin & Tonics: I discovered the G&T when I was living in the UK, but I fell in love with it as a warm-weather drink when my husband first made one for me. He's a great bartender, and you know it's spring when he puts away the whiskey and brings out the limes. Top down: I am a convertible girl -- have been since my father bought a 1972 Fiat Spider when I was 10. Nothing heals my spirit faster than driving with the top down on a sunny spring day (while wearing sunscreen, of course). Post-dinner playtime: With longer daylight hours, the kids can go outside and play after dinner. There's just something lovely about listening to my children laugh as they run around the yard with Daddy in the evening. So how do you know it's spring? And what little things do you do to celebrate the season? Before we had children, my husband and I watched lots of movies. Sometimes we went to the movie theater for a night out. Other times we'd watch whatever was on Turner Classic Movies, occasionally watching two or three movies back-to-back late into the night. But often, we'd find ourselves at the video store (yes, it was VHS for us back then) trying to agree on a movie to rent. If we were at VisArt Video (when we lived in Chapel Hill), we usually made it out safely with some interesting foreign or indie film. But if (Lord, help us) we had to go to Blockbuster, all bets were off. Inevitably, we wasted nearly an hour wandering around the store, unable to agree on anything, before finally picking something out of desperation that neither of us really wanted to watch. By then we were both so irritated that we'd start arguing about anything petty and pointless on the way home, so that we had no interest in spending time together by the time we finally got there. And then the heavens opened, and we subscribed to Netflix. The fighting ended. Happy movie watching ensued, with no late fees. Over the years, our subscription has changed. We used to get 3-at-a-time unlimited rentals back when we could actually watch three movies in a weekend. Now we're on the 2-at-a-time/4-a-month plan, which might still be too much for our lifestyle -- but one of them is usually a kids' DVD, so it works. Our excessively long queue is still filled with new releases, old classics, quirky independents and those series we missed on TV -- but it's also peppered with Bob the Builder, episode of The Muppet Show and some Herbie movies. Nice that Netflix can evolve and grow with us -- just like the marriage it helped save. It's a rainy, unmotivated kind of Monday, but sadly I've got to get my arse in gear. Deadline is approaching and somehow this report on advanced learners isn't writing itself. Hoping that some fiddle and banjo will get me moving. Notice that in the meantime, I'm procrastinating by writing this post. Before I got married, my regular dinner selections were pasta with alfredo sauce (usually all in one box), popcorn (a family tradition) or cereal with milk (my personal favorite). I never touched raw meat and probably never fixed anything with more than four ingredients in it. When I became a (mostly) stay-at-home mom, I began making a real effort to cook more (including the occasional meat dish) to improve both our nutrition and our budget. But actually deciding what to have, finding a recipe I could manage and making it in time to eat was such a challenge that we resorted to frozen pizza, hot dogs or take-out more often than I'd like to admit. So this year I finally decided to start meal-planning to try to make the dinner process go more smoothly and to add some variety to our menu. On Sunday nights, I write out what we're having for dinner each night of the coming week on a dry-erase board that I keep in the kitchen (see photo). I take into consideration what we have in the fridge/pantry, what we haven't eaten recently and what we have going on during the week, then try to pick meals accordingly. It's not rocket science (and I realize other people have been doing it for ages), but this little one-week-at-a-time plan has made a world of difference at my house. Dinner is less stressful, we're wasting less food and my children are learning to eat something other than chicken nuggets and easy mac (not that there's anything wrong with that). Now let's see if I can keep going through second quarter. If you have a favorite recipe you'd like to share, please post it in the comments or leave a link behind. I'll be looking for new menus to take us through spring/summer. Postcards @ Winkflash: The quickest, easiest way to use your photos is to print postcards with one photo on each card. Most sites offer lots of borders and other options, but I like just using a single picture that fills the card with a glossy finish. You can print messages or addresses on the back of the card, or just leave them blank. I like to print a picture of my children at their birthday party, then use the cards for thank you notes. You can print multiple copies of the same photo or get an assortment. At Winkflash, the prices are low and they always seem to send me more than I ordered, but only charge me for the number I selected. Bonus! 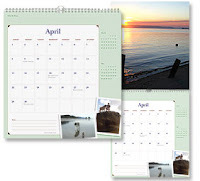 Calendars @ PhotoWorks: Lots of photo sites have calendars, but the nicest ones I've found are at this site. They have multiple sizes and styles (sample above), and the quality of the printing and materials is better than the rest. They've also recently added a perpetual calendar for keeping track of birthdays and anniversaries -- I've been wanting one for ages, so that's my next project. More laughing. Pippi joined in, because she always laughs when Juni is laughing. Okay, that one almost made sense. Then he started laughing and said, "That was funny. I just said food. Tee hee hee!" The trash basket on the top shows we have small children who like to play with garbage. Three shirts and one pair of corduroy pants say that mommy gets the laundry clean and folded, but hasn't figured out where daddy keeps all his clothes (and neither has he). Next, the newspapers from President Obama's election and inauguration tell that we're Democrats -- but we have no system for saving memorabilia. Below that, the framed storypeople print (previously hanging on the bathroom wall, but removed for painting and never returned) says we're good at starting projects, but not as good at finishing them. The wadded up handful of receipts in front suggest purchases that might be returned, so we're saving them just in case. The Thomas the Train library book on the corner was placed there by Junius, who thought we might want to read it at night. The stack of daddy's birthday cards under the book shows he's sentimental enough to hang onto to the cards, but (again) no system for saving them. And the knickknacks (candlestick, frosted bottle, etc.) don't fit, but currently don't have anywhere else to go -- another unfinished project. All that in just one little stack. Sadly, our house is filled with piles, big and small. Everytime I tackle one, another one seems to pop up somewhere else. What do your piles say about you? It's our last day of preschool spring break, so this morning's "New Music Monday" lineup is a kid-friendly one. As many of you have probably already discovered, there's a wide range of kids' music out there, from sappy and annoying to hilarious and rockin. Thankfully, we've managed to find plenty of discs that the whole family loves. Buzz Buzz by Laurie Berkner: If your kids watch Noggin, you've probably seen/heard Laurie Berkner and her band. All-around great music for dancing and playing, including original tracks and traditional songs. "Pig on Her Head" and "Monster Boogie" are fun favorites. 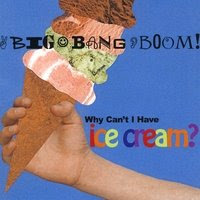 Why Can't I Have Ice Cream by Big Bang Boom: We discovered this band live at the Greensboro Children's Museum and have been groupies ever since. The music rocks, plus it's so fun to be able to take the kids to a show. And you can even book BBB for your next birthday party and be the coolest parents in the neighborhood. Old MacDonald's EIEI Radio by The Biscuit Brothers: We found the Biscuit Brothers on our PBS Kids channel early one Sunday morning and would definitely be groupies if we lived in Texas. Since we don't, we've settled for recreating the show at home with the CD and lots of parades. Teach your kids about musical instruments and terms with a fun soundtrack and plenty of banjo. The Teasing Bird and Other Stories by Ira Marlowe: I'm not sure I've ever heard this whole CD because Juni just asks to hear "Molly the Moose" and the title track over and over again (both of which are great for singing along). This CD combines a broad range of styles, from reggae to rock to techno, complete with jokes for the parents and important lessons for the kids. And you just can't go wrong with a song about a moose who hitchhikes because she's too big for the subway. Jazz for Kids: Sing, Clap, Wiggle and Shake by various artists: Grandpa sent us this winner, which introduces your kids to jazz music by such greats at Ella Fitzgerald and Louis Prima. You haven't really heard "Old MacDonald" until you've heard Ella belt it out. And your kids will love singing about chickens and potato chips. There you have it. Five discs, and not one involves a purple dinosaur telling me he loves me. Thank goodness. We're heading out of town for the long weekend, so I'm posting my Friday list on Thursday -- wouldn't want to disappoint you. Because it's spring break and the kids are out of school all week, I'll give you a somewhat educational five to tide you over. Here are five of my favorite words -- not faves because of what they mean, but because of how they feel in my mouth when I say them. Yes, I know I'm a dork. Links take you to the definitions, in case rolling them around in your head isn't satisfying enough. It's easy for me to get into a rut with music -- the same five CDs can sit in my stereo for months, despite the drawers full of other discs that I could listen to. That's one of the many reasons why I like Pandora so much -- it helps me find new artists without having to try hard. Partly because lists of favorite things are so much fun to make and partly because it seems like a lot of bloggers have some regular items they post on specific days, I've decided to make Fridays the day to post five favorites around a particular topic. For our inaugural Friday's Fave Five, here are five children's books that Junius loves to read -- and so do I. As parents, we often get tired of reading the same parade of Curious George, Dr. Seuss and Thomas the Train -- or maybe that's just me. Meanwhile, there are so many wonderful books out there that haven't had time to become classics (yet), but are fun bedtime reading for all involved. The links for each title will take you to Quail Ridge Books & Music (my most favorite bookstore) -- if you're not within driving distance, you can order online from their store (and feel good about supporting an independent bookseller, which is a rare breed these days). Mercy Watson Goes for a Ride: Written by Kate DiCamillo and illustrated by Chris Van Dusen, this is the second title in a chapter-book series about a pig named Mercy who lives with Mr. and Mrs. Watson and eats lots of hot buttered toast (which became a breakfast staple after we started reading these books). Junius likes this one because it involves the "porcine wonder" in a madcap outing in the family convertible. How I Became a Pirate: Written by Melinda Long and illustrated by David Shannon, this picture book follows little Jeremy Jacob as he joins with Captain Braid Beard and his crew on their quest to bury the pirates' treasure. With pirate-speak written into the story, it's a great read-aloud. Our favorite line is, "ARGH! Soccer!" The sequel, called Pirates Don't Change Diapers, is also hilarious. Albert: Written by Donna Jo Napoli and illustrated by Jim LaMarche, is a beautiful picture book about a man who can't seem to find the right day to go outside. Then one morning when he puts his hand out the window to check the weather, a bird begins building a nest in his outstretched palm. The sweet story describes how Albert helps the birds and learns something about himself in the process. When Dinosaurs Came with Everything: Written by Elise Broach and illustrated by David Small, this funny picture book shows what happens when a boy goes on errands with his mom and discovers that everyone -- the doctor, the barber, the baker -- is giving away a free dinosaur with each purchase. Where will all the dinos go and how will they all get along? Trust mom to make it all work out for the best. This Jazz Man: Written by Karen Ehrhardt and illustrated by R. G. Roth, this finger-snapping, toe-tapping picture book spins the traditional rhyme "This Old Man" into a history lesson about great jazz musicians. Learn about counting, musical instruments and famous artists all in one terrific package. Note: I have received no compensation from Quail Ridge Books & Music or any of the authors or illustrators of these books. However, if any of them wanted to send me some freebies, I wouldn't say no.